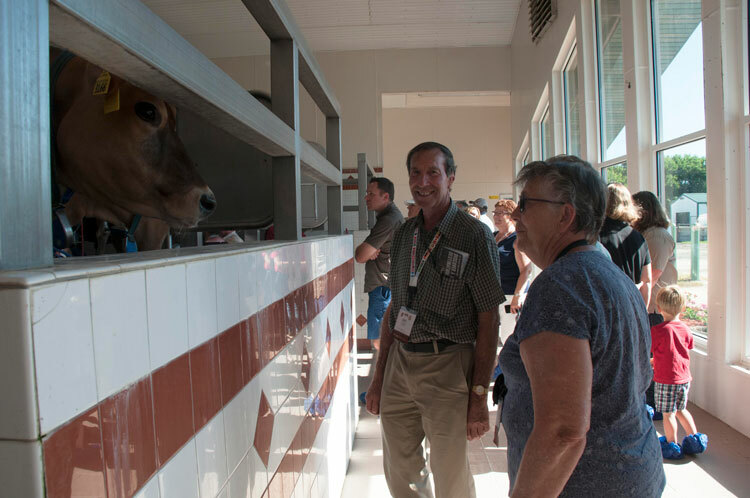 The Hoard’s Dairyman Farm had the honor of hosting a tour stop for the International Conference of the World Jersey Cattle Bureau. 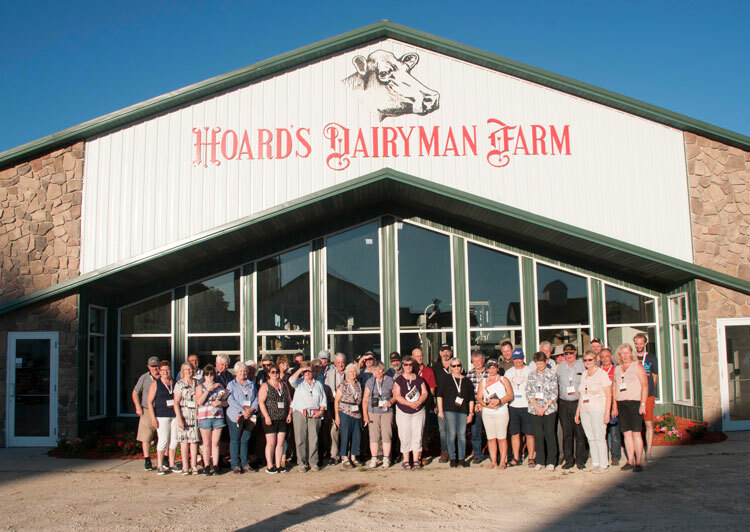 Last night Hoard’s Dairyman had the unique opportunity to host attendees from the International Conference of the World Jersey Cattle Bureau at the Hoard’s Dairyman Farm. When the farm was established in 1899 by our magazine’s founder, W.D. Hoard, Guernsey cattle made up the herd. We still milk Guernseys today; in fact, the Hoard’s Dairyman Farm is home to the oldest continuously registered Guernsey herd in North America. In 2009, we introduced the Jersey breed into the mix, and they have been a great fit ever since. Today, the herd is about one-third Jerseys and two-thirds Guernseys. A passion for the little brown cow is what brought Jersey enthusiasts from around the globe to our farm. These people were part of the World Jersey Cattle Bureau’s international conference, an event that takes place every three or four years. The American Jersey Cattle Association hosted the 2018 conference, which coincided with the 150th anniversary of their association. As part of their 2.5-week long trip across the United States, the participants first traveled west to Oregon and California. Their next stop was Ohio to participate in the National Jersey Convention. The third leg of their trip brought them to the Midwest, where they are visiting farms and landmarks of interest in Illinois and Wisconsin. 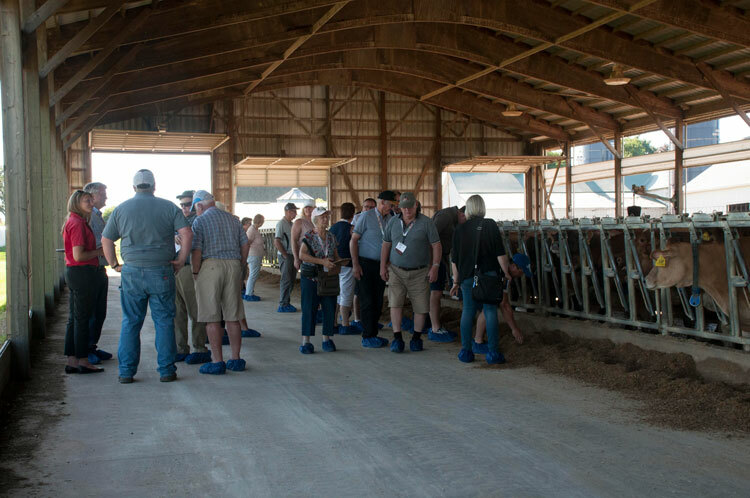 Their visit at the Hoard’s Dairyman Farm included a brief history about the magazine and farm, followed by comments from the company’s president, Brian Knox. Farm Manager Jason Yurs then led the group on a walking tour around the farm. Time was also spent in the cattle pens looking at the Jersey cows. Following supper and fellowship, the group loaded the bus and headed off for their next destination. The 38 international attendees came from a number of countries, including Australia, England, France, New Zealand, and South Africa. Some were first time attendees of the conference; others have participated in years past. An Australian woman on the tour attended her first conference back in 1972. She has since participated in 15 events, traveling all over the world. “I have been everywhere, and it’s all because of the Jersey cow,” she said with gratitude. We were grateful to have been a small part of her and the other participants’ international experience. Ev Thomas, Oak Point Agronomics, will present “The lowdown on reduced-lignin alfalfa” on Monday, July 9, at noon (Central time). There’s considerable interest in reduced-lignin alfalfa, which comes from both genetically modified varieties and those developed using conventional plant breeding. Reduced-lignin alfalfa can provide very high quality forage, but it requires harvest timing decisions, may be used in a grass mixtures, and has a ration impact. Register here for all webinars.